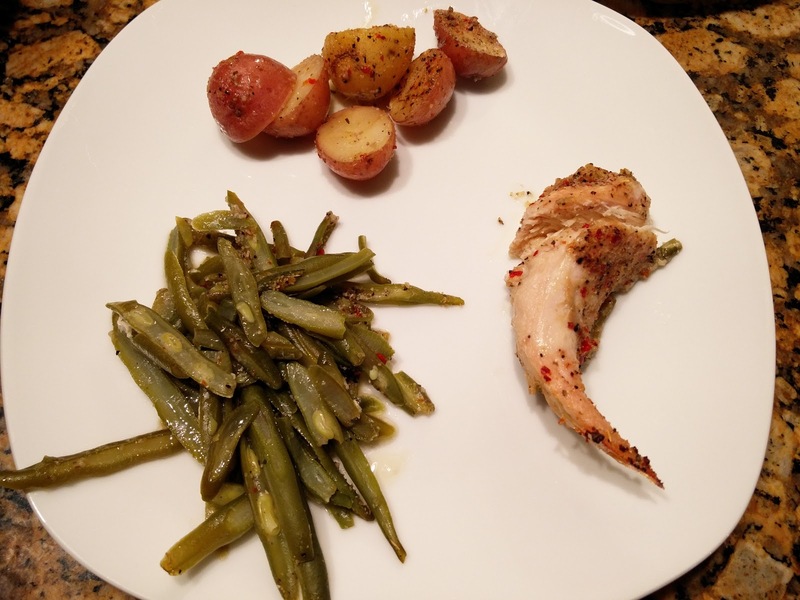 This was a super quick and easy meal that was put together in less than 20 minutes. We made it, then went to do errands and came back to dinner done! 1. Take the Bratwursts out of their casing by slicing them lengthwise. 2. Fry the bratwurst meat on a pan for about 4-5 minutes until done. 5. 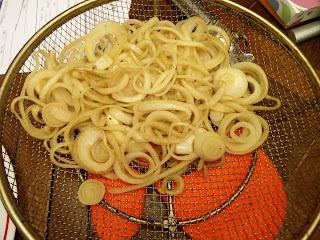 Transfer onions into the slow cooker. We saw a recipe for coffee marinated meat and we were intrigued. And then disappointed. 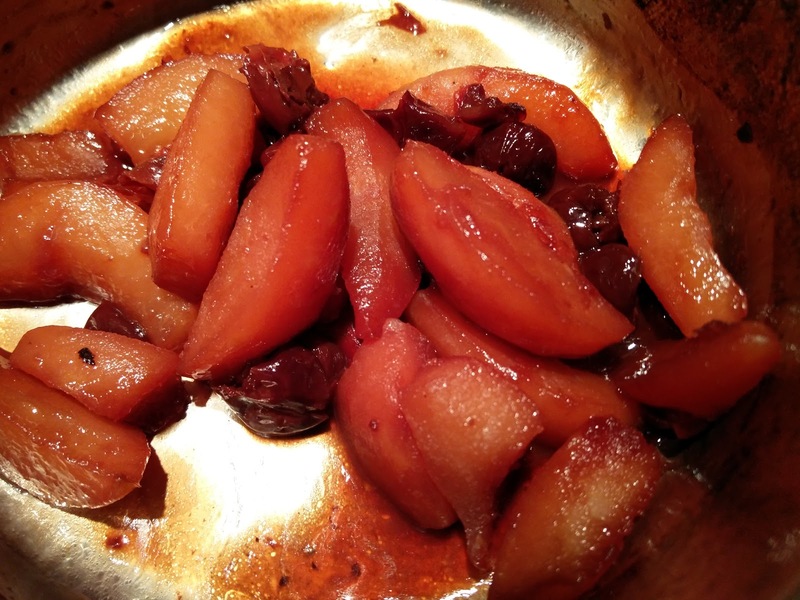 Wine or vinegar or citrus recipes definitely make the meat more tender and delicious. While this was still good, it just wasn't as good as the other tried options. 1. Combine all ingredients into a ziplock bag (put the meat and onions in first, then pour the coffee over). When cooled, move to the fridge for at least 4-6 hours. 2. Put meat onto skewers and grill to desired done-ness when ready. 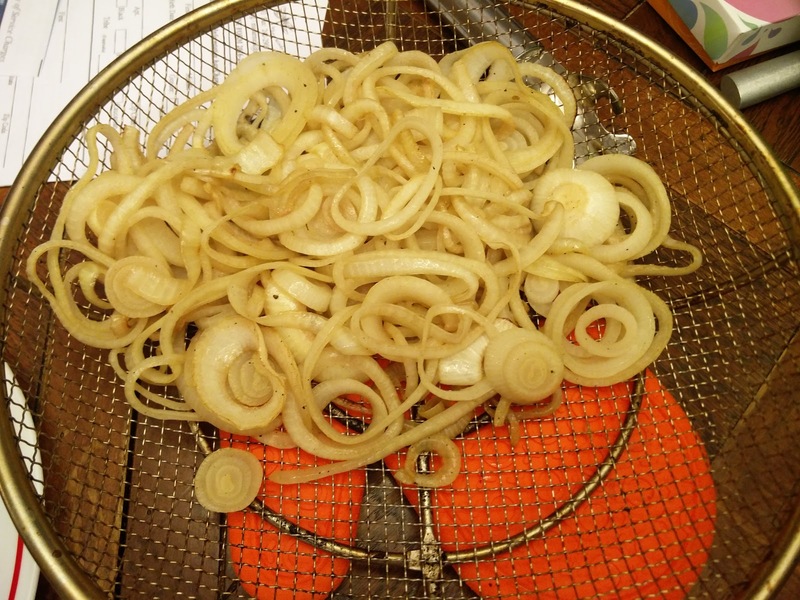 Grill the onions either directly on the grill or in a grill basket. 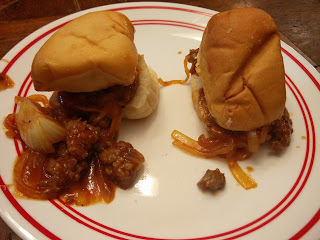 It was definitely a new way to make meat that we liked trying. 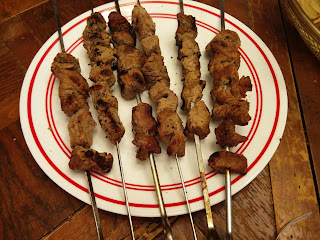 The meat was a little chewy and not as soft as it would have been in other marinades. The issue may have been that we used a "light" roast coffee, which may not have been as effective as a darker roast. This meal did not warrant his attention at all. We probably wouldn't do this again. We didn't mean to disappear for a while, but life kind of got hectic. Kaspian started school, we had a birthday party for Alona's dad, working on the Ruidoso house. We have been slightly too tired to do our regular updates to the blog. Hopefully, we can get back to keeping up with it. So, we kind of cheated on the chocolate cake for the cupcakes as we used a mix and added chocolate chips to it. 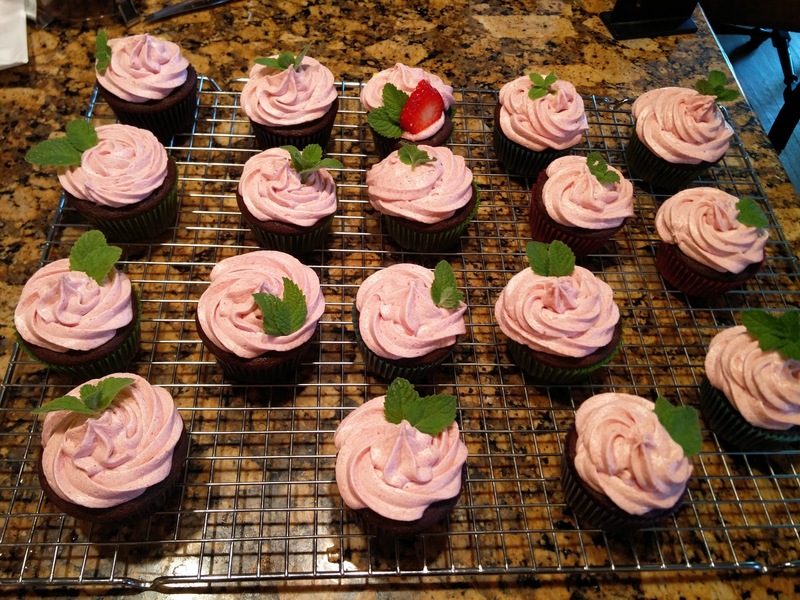 We had some strawberries and really wanted to make a strawberry frosting for the cupcakes. 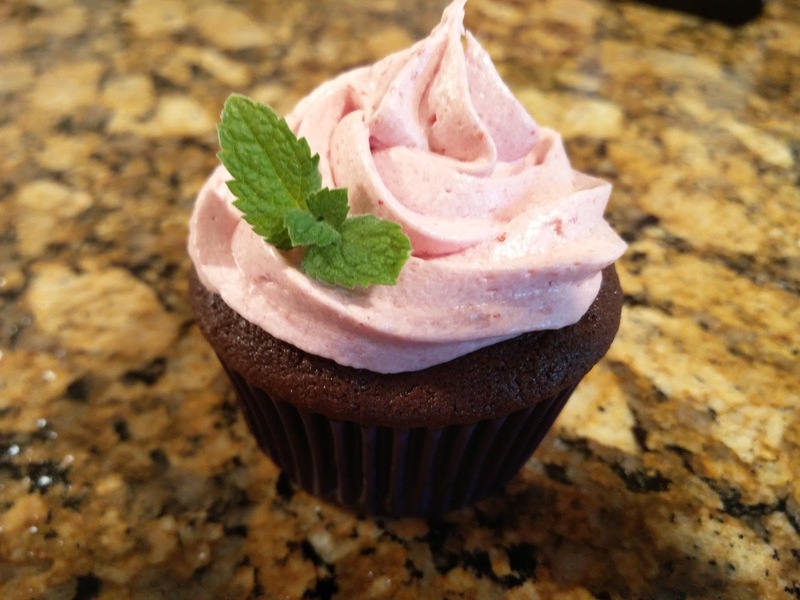 This turned out a little tricky as the strawberry puree changes the texture of the frosting and makes it not quite as "fluffy" and able to stand on its own. 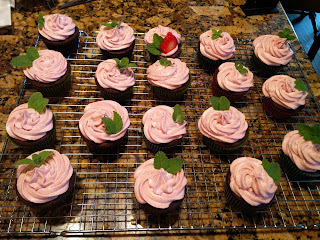 So, definitely refrigerate them after making to avoid the frosting getting droopy and liquidy. We also had some mint growing in our yard, so we decorated the cupcakes with some mint leaves. It added a nice touch of green color to the cupcakes. Since we used a mix for the cupcake batter, we will only give the frosting recipe here. ½ cup butter (1 stick), room temperature. 2. Pour puree into a small saucepan and cook on medium heat, stirring constantly, until mixture reduces and is about the texture of polenta/grits (takes about 6-7 minutes). 3. Pour puree through a fine-mesh sieve, pressing on the solids with a spatula, and into a bowl to cool. Puree will be thick. 4. Next, in a medium bowl, cream the butter with hand-mixer on medium, until fluffy. Add powdered sugar, a little at a time, until mixed. 5. Add 5 tablespoons of puree to the mixture. Mix well. 6. 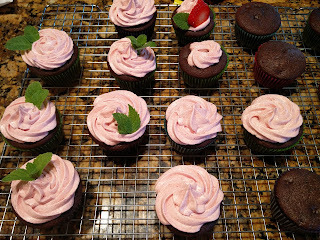 Spread or pipe onto cooled cupcakes. 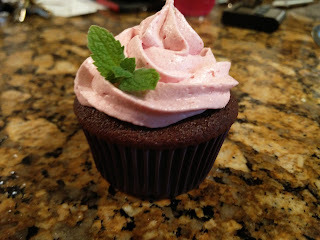 The frosting tasted delicious with the chocolate cupcakes! The frosting melted at room temperature. He really wanted some green frosting, but he was okay with strawberry. He mostly wanted to "save" his cupcake. maybe less strawberry puree? Might want to try some strawberry syrup as well. 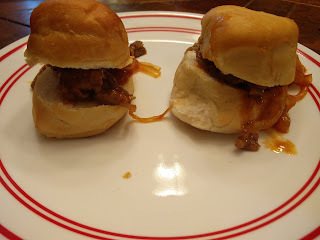 We saw this recipe a couple of weeks ago when hunting for a quick recipe to throw together. 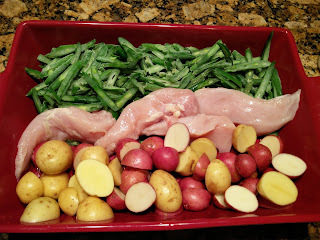 We ended up googling Chicken, Green Beans and Potatoes, as those were the ingredients we had and this recipe came up. However, we did not have the italian seasoning it called for at the time, so we couldn't make it right away. Now though, italian seasoning might be something we would just want to have on hand :) Or, we usually have the liquid version - maybe we could just use that to recreate. This was really really good. And sooo EASY. 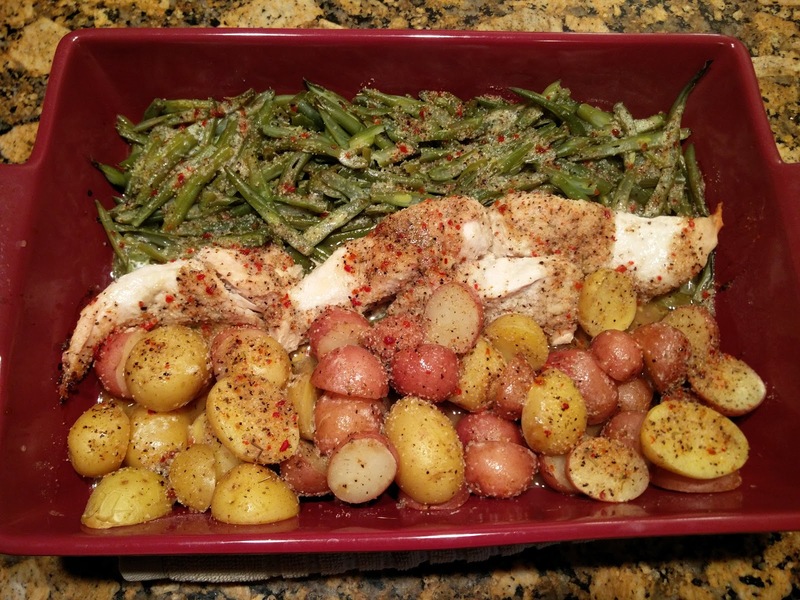 It took all of ten minutes to throw everything together, and that's with cutting the potatoes in half. Throw everything together, and bake for an hour! And, it looks great! We cut our chicken breasts in half to make the pieces all same sized. We also did not add any salt and pepper as we did not think the recipe needed it. Just the spices and butter needed! 2. Wash the potatoes. Cut in half. 3. 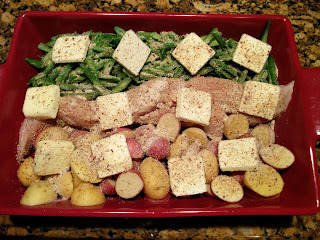 Line one side of a 9x13 baking dish with green beans and line the other with the potatoes. 4. Place the chicken breasts between the green beans and potatoes. 5. Cut the butter into approx. 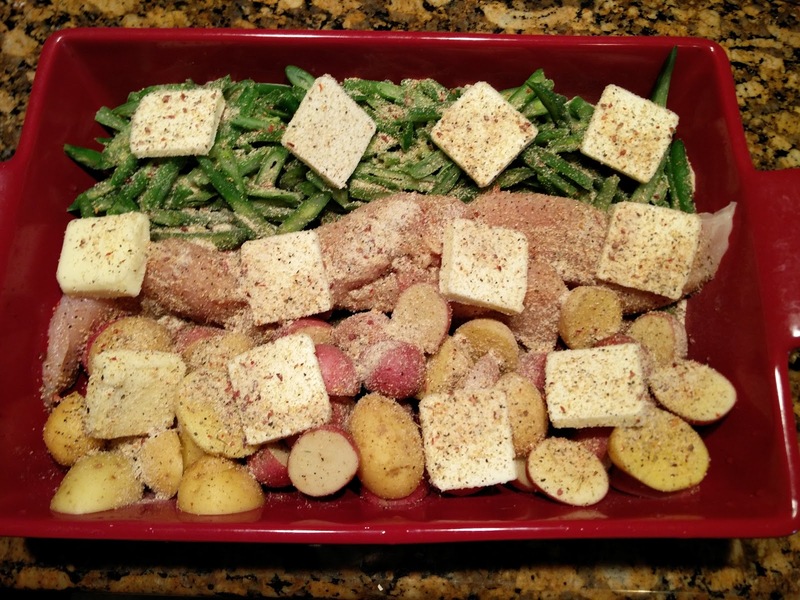 1 tbsp squares and place evenly over the green beans, chicken, and potatoes. 6. Sprinkle entire dish with Italian seasoning. 7. Cover with foil and bake for one hour. Nothing it was really great. This is a great, quick and easy stir fry. 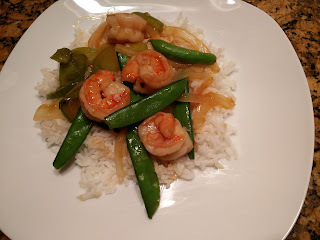 It is great with rice and while the rice cooked, the stir fry can be put together. You can vary this by adding whatever vegetables you have - we think most vegetables will work for this. Another thing that may have been fun to add is some water chestnuts - this would have added a satisfying crunch to the plate. 2. Combine soy sauce and crushed red pepper in a bowl. Stir in cornstarch with a whisk until smooth. 3. Heat a large wok or skillet over high heat. Add 1 1/2 tablespoons oil; swirl to coat. Add ginger, shrimp, and garlic; stir-fry 3 minutes. Remove shrimp mixture from pan. Return pan to high heat; add remaining 1 1/2 tablespoons oil. 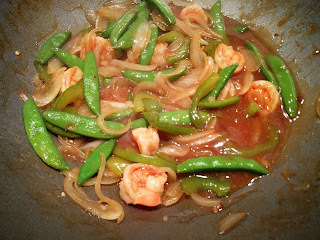 Add onion, bell pepper, and snow peas; stir-fry 3 minutes. Add soy sauce mixture, stock, and 1/2 cup water to pan; bring to a boil. Stir in shrimp mixture and basil; cook 1 minute. Serve with farro. He was more into his chicken nuggets. This soup is perfect for the colder weather. The best potatoes for this are golden yukon potatoes, but this particular time we just made it with russets and it still came out super delicious. The recipe is a little bit time consuming, but oh so worth it for the yummy bowl at the end. 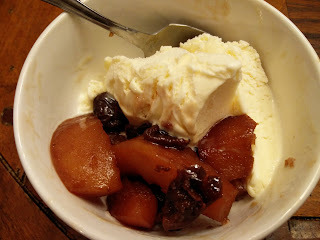 We also acquired some home made bacon from our local farmers market to use in this recipe, so we had less than what it called for but the flavor was unbeatable. 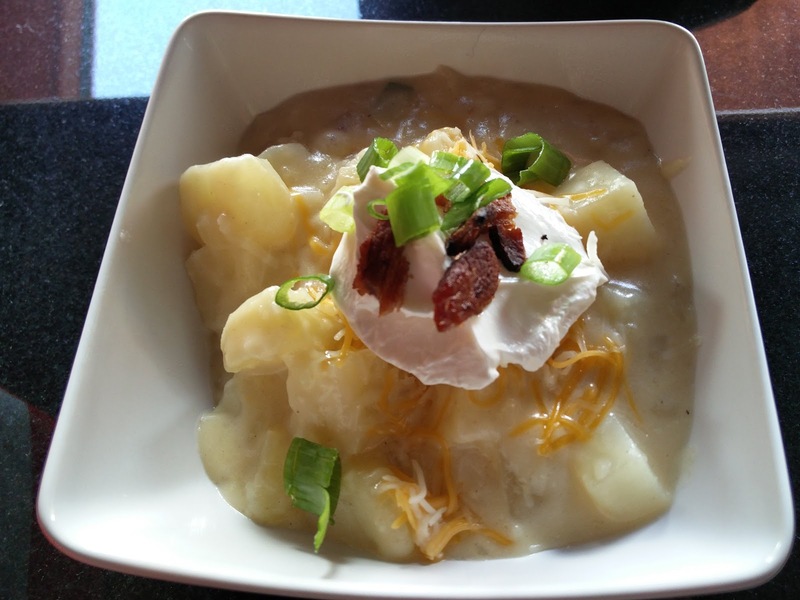 Chives, sour cream, and bacon are a must to top off the bowl for the very tasty combination. 1. In a large stock pot, cook bacon until crisp. Remove bacon and set on paper towels. Drain all but 2 tablespoons of bacon grease form the pot. 3. Add potatoes and chicken stock to pot. 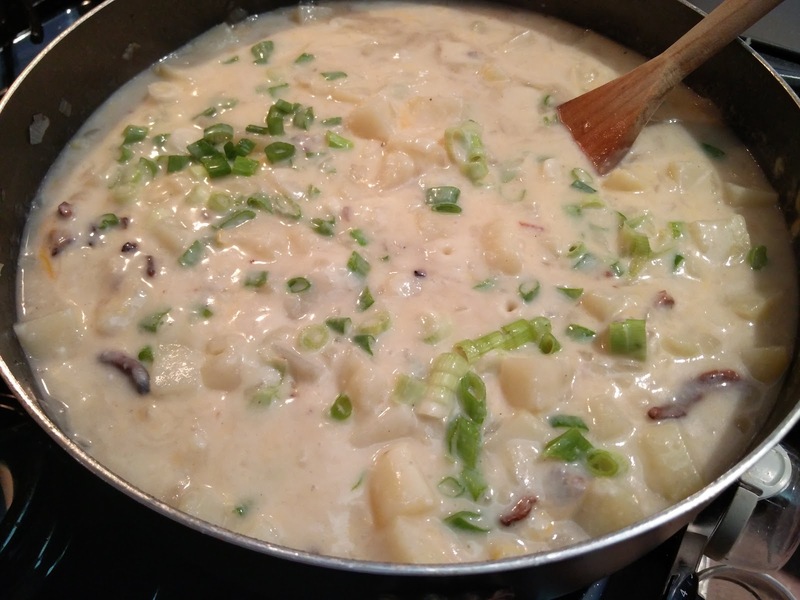 Bring to a boil, reduce heat to medium and simmer about 20 minutes until the potatoes are tender. 4. With a slotted spoon, remove about a bowlful of potatoes. Mash with a fork and set aside. 5. In a small saucepan, melt the butter. Stir in the flour and cook for two minutes. Whisk in the milk, bring to a boil and simmer until thickened. Slowly stir into the stock pot. Bring to a boil, reduce heat to low and simmer. Stir in the mashed potatoes. 6. Add 3/4 cup of cheese,3/4 of the bacon, and half the sliced green onions into the pot. Add pepper and stir to combine. Cook for an additional five minutes. 7. 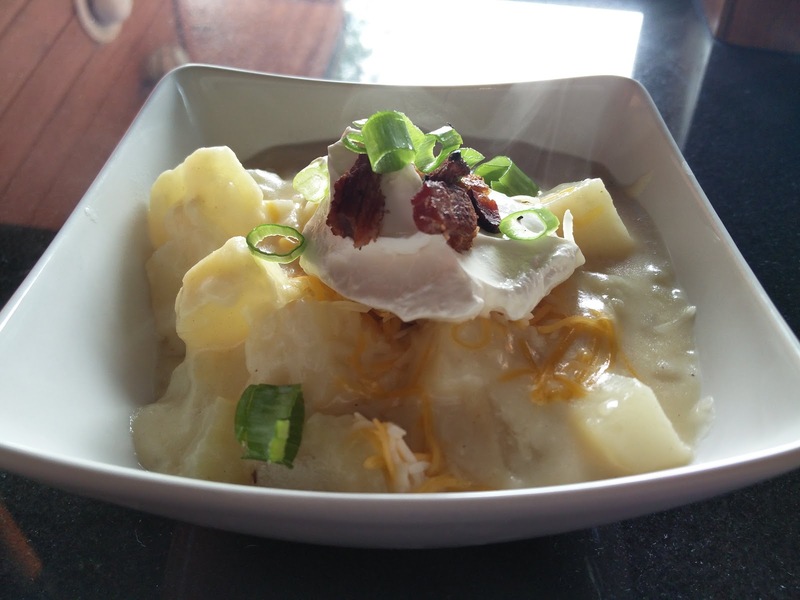 To serve, put soup into bowls and top with sour cream, cheese, bacon, and green onions. The flavor of this soup! He was more into alternate food options at the time.